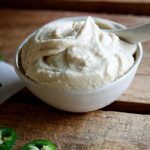 When I received a tub of Mediterranean Delicacies’ Feta & Herb dip I knew it would go incredibly well with meat. And even though Ostrich isn’t necessarily ‘meat’ (it does come from a bird after all), it’s still very meaty in flavour, texture and appearance, reminding me of a mix between beef and venison. I know it might not be something that is easily obtainable in other countries but in South Africa we have great ostrich meat and the fact that it’s such a healthy meat alone is enough to get me to eat more of it. However, this recipe can also be made with beef and even lamb. I simply marinaded cubes of ostrich steak in olive oil, lemon juice, salt and fresh rosemary and a splash of Worcestershire sauce for 20 minutes and then skewered onto soaked bamboo skewers before braaing them to perfection. 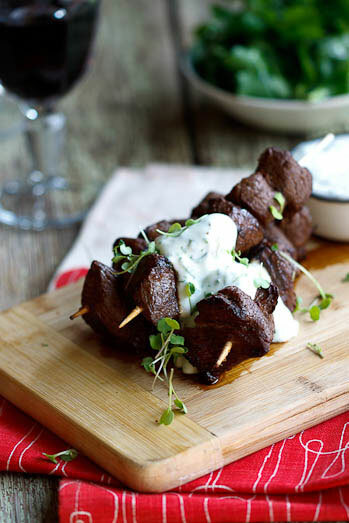 I served the skewers with the MD Feta & Herb dip which I added a few tablespoons of thick Greek yoghurt to. 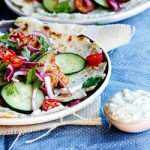 Along with a simple rocket salad and a glass of red wine, this is a great, light dinner option! Combine the ostrich cubes with the olive oil, lemon juice, worcestershire sauce, fresh rosemary and salt and allow to marinate for 20 minutes. Skewer the meat onto soaked bamboo skewers and grill/braai for 10-12 minutes until the meat is cooked to your preference. 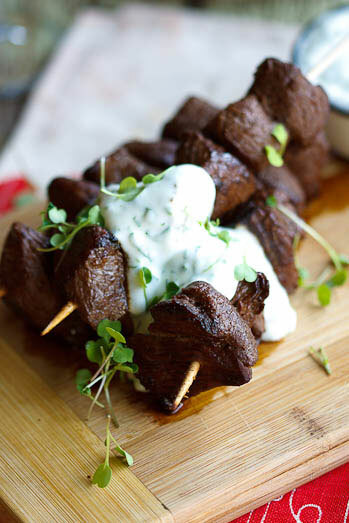 Combine the Feta & Herb dip with Greek yoghurt and spoon over the cooked ostrich kebabs. Serve.